GRK's R4 self-countering screw has a new underhead with saw-blade like cutting teeth and six self-contained cutting pockets. Together they act similar to a circular saw blade, transporting the drill dust away from the edge of the screw hole while cutting a perfectly clean hole into even the most brittle materials without cracking any surface treatment. This design also further enhances the R4 versatility by allowing the fastener to be installed without countersinking into even the hardest woods. The R4 screw closes the hole off with precision, leaving no damaged fibers around the head. Applications include wood, particle board, plastic, sheet metal, cement fiberboard, composite decking, wood decking and melamine. 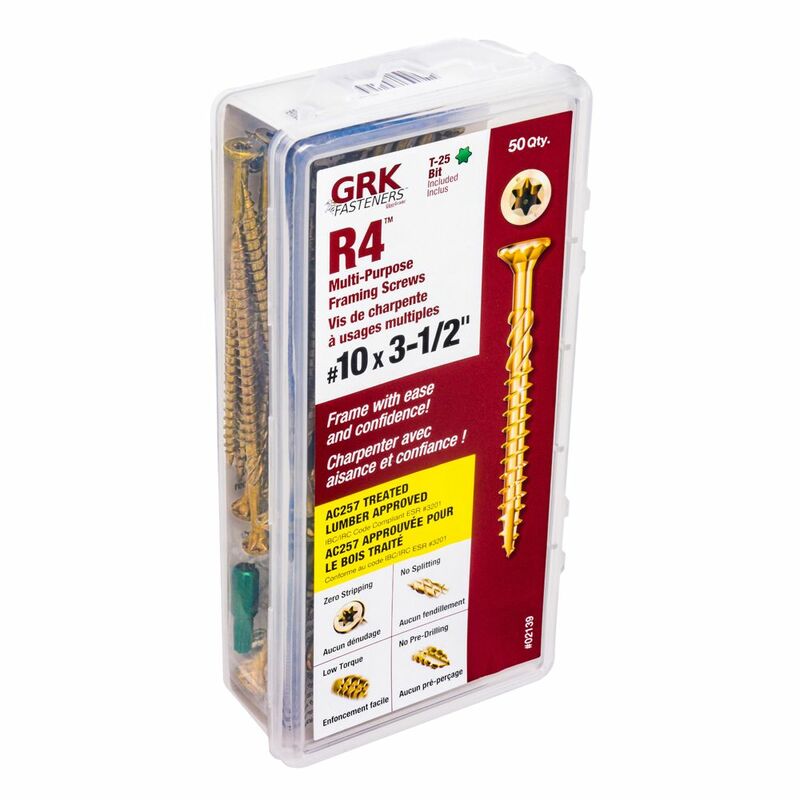 #10 x 3-1/2-inch Star Drive GRK R4(TM) Multi-Purpose Framing Screws Handy-Pak - 50pcs GRK's R4 self-countering screw has a new underhead with saw-blade like cutting teeth and six self-contained cutting pockets. Together they act similar to a circular saw blade, transporting the drill dust away from the edge of the screw hole while cutting a perfectly clean hole into even the most brittle materials without cracking any surface treatment. This design also further enhances the R4 versatility by allowing the fastener to be installed without countersinking into even the hardest woods. The R4 screw closes the hole off with precision, leaving no damaged fibers around the head. Applications include wood, particle board, plastic, sheet metal, cement fiberboard, composite decking, wood decking and melamine.